Comet 216836-A Reverse Wind CAM Spring for Comet 90D Driven Units (Blue). Home > Comet Clutches and Parts > Comet 216826C. 90D Driven for PUG > Comet 216836A Reverse Wind Spring for 90D Secondary Pulley. Comet 216836A Reverse Wind Spring (Blue) for 90D Secondary Pulley. Comet 216836A Reverse Wind Spring for 90D Secondary Pulley. 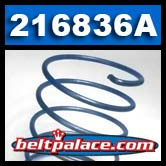 Comet 216836A Reverse Wind Cam Spring for Comet 90D Driven Units (Blue). Allows for Outboard mounting of Comet Industries 90D Secondary pulley where spacing has become a factor (Cam and Spring on opposite side of engine/transmission). IN STOCK! MADE IN USA BY COMET INDUSTRIES. Comet 212291A Driven Clutch. 1" Bore. Comet 90D. Comet 212291A Driven (Secondary) Clutch. 9.91" Diameter. Comet Industries 90D Series Clutch. 1" bore, INBOARD mounted. Comet 212299A. Comet Industries 90D Series Driven Clutch. Comet OEM Part 212299-A. Specs: 9.91� Diameter, 3/4� Bore, 3/16� Key, 1-3/16� TW Belt. �Brown� Spring LH Wind. Requires INBOARD Mount. Optional Reverse spring available for Outboard Mounting on King Midget Cars and others. Call for Availability. Comet Industries 216826C. 9.91" Dia., 3/4" Bore. INBOARD MOUNT Comet 90D Secondary Pulley for Feterl PUG.